Azua is a Dominican province; it is in the southern part of the country, along the Caribbean coast. Its capital is Azua de Compostela. After the Dominican independence from Haiti, Azua was one of the five original provinces of the country; all the southwestern part of the country was part of this province, including some regions that now are part of Haiti. 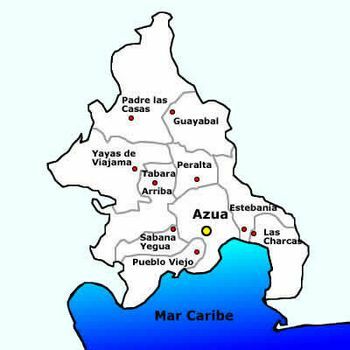 Azua has the La Vega province to the northeast, the San José de Ocoa and Peravia provinces to the east, the Caribbean Sea to the south, the Barahona and Baoruco provinces to the west, and the San Juan province to the northwest. There were people living in the region since a very long time, most of them along the coast. When the Spanish people came here, only Taínos were living here. During colonial times, Azua de Compostela was one of the most important city of the Hispaniola island because there were several factories to produce sugar. Hernán Cortés, conquistador of Mexico, was one of the persons who lived here for some time. After the independence in 1844, there were several important battles in this region between the Haitian and Dominican armies and Azua de Compostela was burned several times by the Haitian armies. Padre Las Casas is a municipality of the province since 1942; later, other municipalities were created: Peralta in 1978; Las Charcas, Las Yayas de Viajama and Estebanía in 2001; Sabana Yegua and Pueblo Viejo in 2003; and Tábara Arriba and Guayabal in 2004. In 2010 (last national census), there were 214,311 people living in the Azua province, and 165,703 (77.3%) living in towns and cities. The population density was 84.6 persons/km². Its population represents 2.27% of the total population of the country and the province is ranked as the 23th (out of 31 plus the National District) more populated province. As of 2016[update], the total estimated propulation of the province is 219,856 inhabitants. 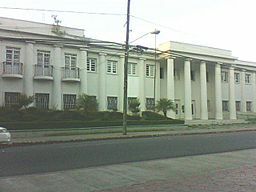 The largest city of the province is Azua de Compostela, its head municipality or capital, with an urban population (in 2010) of 59,319 inhabitants. The Azua province has a total area of 2,682.5 km2 (1,035.7 sq mi). It has 5.6% of the area of the Dominican Republic and it is ranked as the 5th (out of 31 provinces plus the National District) largest province. The altitude of Azua de Compostela, provincial capital, is 83 m (272 ft). Most of the Azua province is in a very dry valley (the Azua Valley or Azua Plain); cacti and other plants of dry regions are common in this valley. The Cordillera Central ("Central mountain range") runs along the northern half of the province. To the east, there is the Sierra de Ocoa (part of the Cordillera Central) that separates this province from the Peravia province. To the west, there are the Sierra Martín García and Sierra de Neiba. The most important rivers are the Yaque del Sur and its tributaries Las Cuevas and Grande or Del Medio. Other rivers are Ocoa, Jura and Vía (that flows through the city of Azua de Compostela). The only important road in the province is the Carretera Sánchez (Sánchez National Road) that goes through the southern part of the province; the road goes from Santo Domingo to the western part of the country, to the border with Haiti. The other roads are not so important and they go from the different municipalities or municipal districts to the Carretera Sánchez or to the city of Azua de Compostela. The Azua port is in the municipal district of Puerto Viejo; it is a small port. The main economic activity in the province is farming. In the valley, the most important crops are and the main products are banana, plantain, vegetables and fruits like mango. High on the northern mountains, coffee and beans are important products. Fishing is important along the Caribbean coast. Azua Province Facts for Kids. Kiddle Encyclopedia.